“Eat your greens!” Well, since current research in nutrition is telling us that greens are the key to vibrant health, I am always looking for interesting ways to eat them. One of my favourite restaurant dishes is zesty Szechuan Beans. I could literally make a meal of them. When I saw today’s recipe in Bon Appétit, July 2014, I just knew that I might have found a new fave! I was not let down! 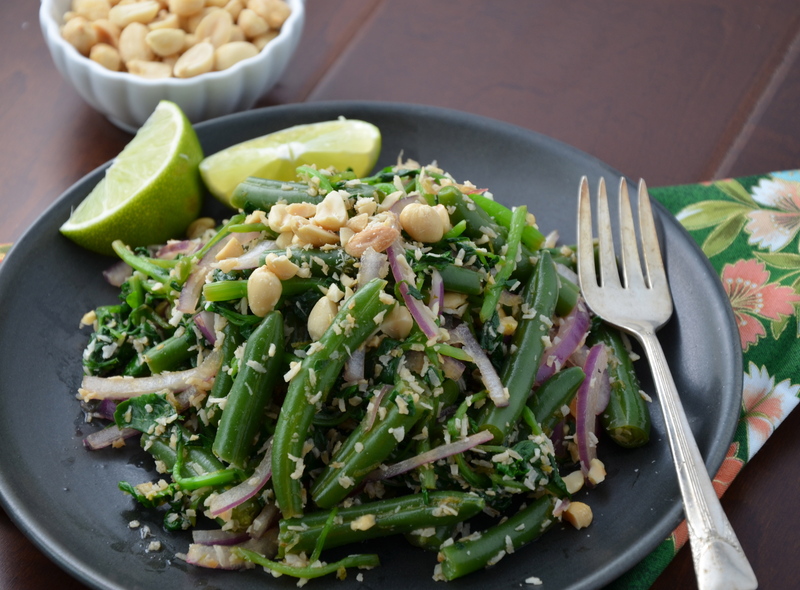 This recipe doesn’t have the firey bite of Szechuan beans, but I could still wolf down a whole plate at one sitting, inhaling the sweet earthy combination of coconut and peanuts and the peppery bite of watercress. This dish would make a wonderful accompaniment to any of your favourite proteins and especially the spicy ones. I am imagining it with some zingy buffalo wings and a crisp, cold glass of Pinot Gris. A couple of things to note here: don’t worry if you cannot find the Chinese long beans. I couldn’t find any in my local veggie markets, but some fresh green beans worked beautifully. Also, it’s really important to plunge the cooked greens into the ice-water. The vibrant green colour and crispness of the veggies cannot be achieved if you miss this step. I am excited to bring a giant bowl of this Long Bean Salad over to Angie’s Fiesta Friday. If you haven’t visited Angie’s blog, The Novice Gardener, you really must! Every Friday for the past 34 weeks, Angie has been hosting the most happening, virtual blog party in the blogosphere! We feast, sip, laugh and enjoy each others’ company, as we share our latest and greatest discoveries. So here’s to Angie and her amazing co-hosts who have been keeping us happy now for so many weeks! Place coconut in a small skillet and toast until golden. Remove to a plate to cool. Meanwhile immerse watercress in a large saucepan of boiling, salted water until just wilted, about 10 seconds. Using a slotted spoon, transfer to a colander, and set in a large bowl of ice water. Drain, then gently squeeze out the excess water. Return water in saucepan to a boil. Cook beans until crisp-tender, about 4 minutes. Transfer to ice water. Drain, then pat dry. Whisk fish sauce, lime juice, and coconut sugar in a large bowl until sugar dissolves. Add watercress, beans, onion, and kaffir lime leaves and toss to coat. Serve topped with coconut and peanuts. These flavors all sound delightful – especially the peanuts! Hey Mimi, thanks so much! The peanuts really do make this dish special! Thanks so much for the reblog, Glenda! I appreciate it! I love Bon Appetit and actually bookmarked this recipe in my copy to make someday! The green is super vibrant and tasty-looking. Wonderful dish for a party, Julianna! Happy weekend. Fantastic recipe Julianna, love all the flavors going on, and it does look very appetizing too. Happy FF! So super simple & delish! I love your suggestions of pairing it with Buffalo Wings & a chilled glass of Pinot Gris. Now that’s a combo that would pop! 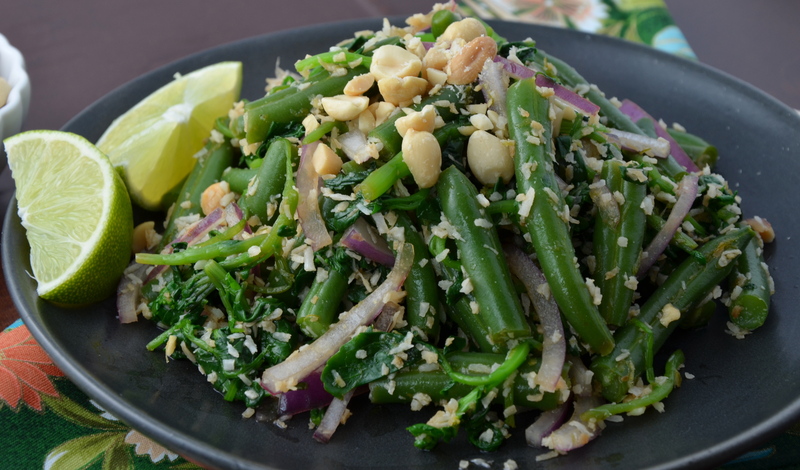 Love long green beans and with coconut and peanuts, they taste amazing. Beautiful post Chef! These look so simple and tasty, Julianna! Thanks for bringing this to Fiesta Friday! Ooh la la Julianna, this salad sounds like a party in your mouth! Love the combination of flavors you have come up with! Such a tempting way to eat your greens 😀 Thanks for sharing at FF! Thanks Julianna, I always go for the veggies first and these will not disappoint. I have no problem eating my greens, and would love a plate of yours! Hi Julianna! I know you already have plenty of awards and I also know you are a busy women! That said, I couldn’t NOT nominate you for the Very Inspiring Blogger Award because YOU INSPIRE ME! ❤ Here is the link to follow if you want to participate. I totally understand if you don't though! Hey Judy! Hope you give this a try! Please let me know what you think! Hey Prudy! Thanks so much for your very kind comment! I hope you do get a chance to make this recipe and that you really love it! 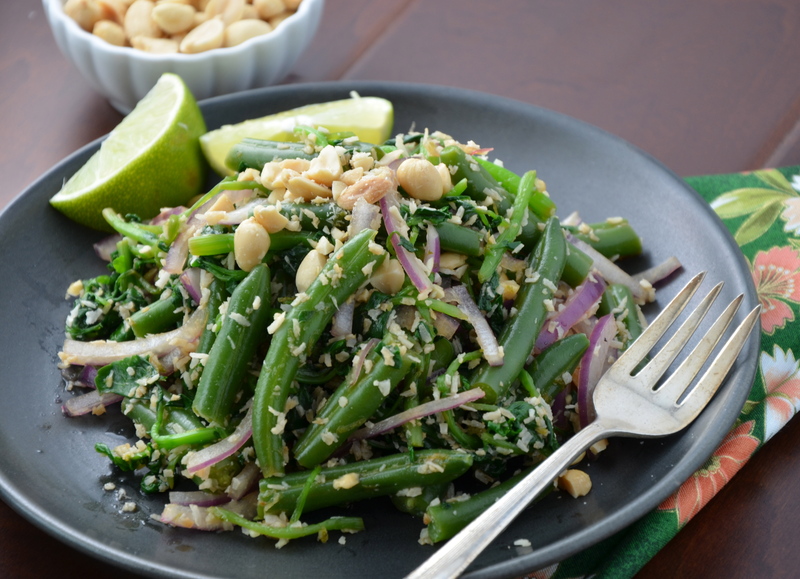 I love my greens, but this salad looks so delicious I want to eat it every day! LOL, Michelle! I know, I could probably eat it every day too! What a lovely and delicious salad Julianna! Love all the flavors you have here!